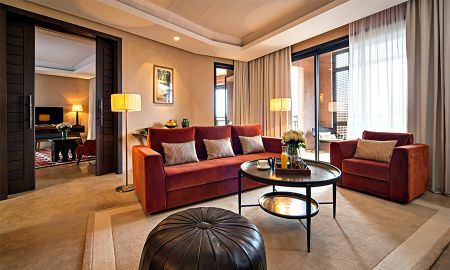 Both elegant and spacious, this 72 m2 suite consists of a lavish bedroom with a seating area, a luxurious marble bathroom with beijmat floors and a refreshing terrace opening onto the golf course and Atlas mountain range. A wide range of orange hues, from soft to vibrant and pops of red and yellow give an instant sense of warmth and comfort to the interiors. Hand-made furnishings designed by local craftsmen, traditional Moroccan rugs with colorful geometric patterns and decorative moucharabiehs help create an authentic Moroccan vibe. From Thursday 18 January 2018 until Thursday 31 December 2020: Enjoy 15 % off! This 86 m2 villa is perfect for a single-child family. 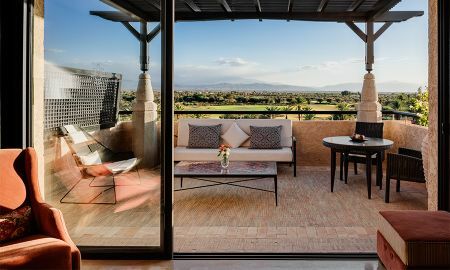 Offering a spacious bedroom with a beautiful en suite bathroom, it opens onto a lovely terrace with a view of the golf course and Atlas mountain range. 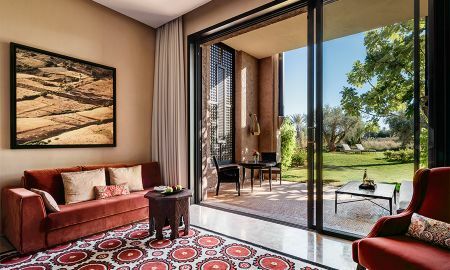 The interiors offer a modern interpretation of Moroccan style with staple accessories such as wooden moucharabiehs, Berber rugs and opulent custom-made furniture. Warm colors used in various shades create a cosy space while capturing light. The luxurious bathroom finishes use traditional building materials such as beijmat and marble. Space, comfort and elegance are essential words to describe this luxurious suite of 126 m2. Designed both with beauty and practicality in mind, all rooms connect with each other. Creamy shades command the most space in the bedroom’s color palette. Painted in a bold deep-red colour, the lounge area connects onto the outdoors through a large terrace designed with intimate gatherings in mind. 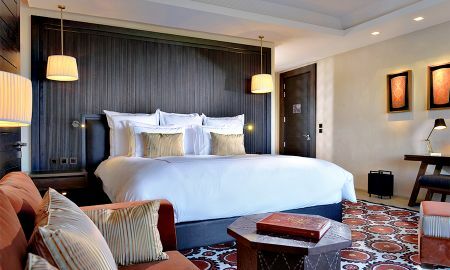 The same refined decorative style blending modern elements and Moroccan accents is continuous throughout the suite. Both spacious and functional, the beautiful bathroom is a shrine to Moroccan craftsmanship. With a total surface area of 124 m2, the Family Suite will certainly create enormous appeal with families of two adults and two children. In line with other suites of the hotel, interior decoration is a mix of Moroccan design and modern style. The master bedroom is enveloped in warm, soothing neutral hues with light touches of grey and blue. 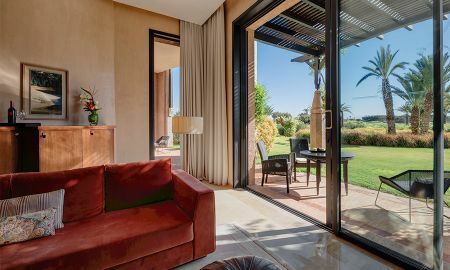 Equipped with a cosy seating area, the master bedroom extends on one side onto a bright terrace and on the other onto a superb en suite bathroom. Leading onto an outdoor terrace, the children bedroom is equipped with twin beds. Kids also have their own private bathroom. 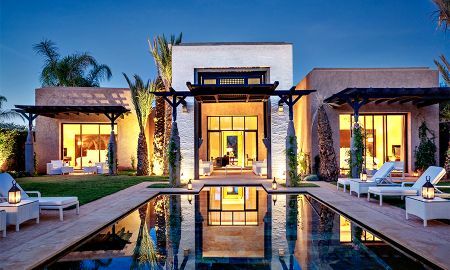 Set in the midst of an age-old olive grove, on a patch of ochre-colored land lying in the shadow of the snow-capped peaks of the Atlas Mountains and only twenty minutes away from the bustling old medina of Marrakech, Fairmont Royal Palm offers an exclusive retreat combining residential style living with a range of leisure offerings. Featuring lavish rooms, suites and villas, they are an invitation to spend time with the family or enjoy true moments of relaxation in an intimate setting. Each of them also offers unique and privileged views of the Atlas Mountains. The resort also boasts unmatched amenities including an expansive 18-hole golf course, six eclectic restaurants and bars offering local and international fine dining, a 2,000 sqm swimming pool, a Spa offering the ultimate escape and relaxation and a 500 sqm Kids' Club promising your little ones a world of discoveries. Rising on the Amizmiz road, the hotel is 12 km and about 20 minutes from the city center. Fairmont Marrakech offers free shuttle round trip every day to and from the city center or the medina, from 9:00 am to 09:00 pm. After 09:00 pm, guests may request a paying private shuttle service. Starting from November 1st, children under 11 years sharing beds with their parents will stay for free of charge and have the same meal plan as the adults. The credit card serves as a guarantee and will only be charged in case of a no-show or late cancellation.